The world has learned nothing from the Holocaust. Silence and fear then. Silence and fear now. Worse still, the United Nations, created to prevent genocide, actually aids and abets it. They just gave a terror organization additional power at the United Nations in order to lead the G77, the largest voting bloc at the global body. No enemedia coverage on this genocide. Only Christian publications are reporting on this. Global Christian News; More than 55 people were killed on Thursday, 18 October, when violence broke out between Muslim and Christian youths in Kasuwan Magani village, south of Kaduna State in central Nigeria. Details of how the attacks started are unclear, a witness account said Muslim youths attacked the market over right-of-space by wheelbarrow pushers between Christian and muslim youths. The attack soon spread to much of the village with homes, stalls and business premises looted and burnt and over 20 people sustaining various degrees of injuries. The Kaduna State Governor, Nasir El-Rufai, when he visited the village, said the police had confirmed that “55 corpses have been recovered; some burned beyond recognition.” El Rufai then imposed a dusk to dawn curfew on the local council. “This country belongs to all of us. This state belongs to all of us. No one is going to chase anyone away. So, you must learn to live with everyone in peace and justice,” he told the community. On Friday, however, a day after the governor’s visit, the traditional ruler of Adara chiefdom, Agom Adara, Maiwada Galadima and his wife, Victoria, were kidnapped and four of his security details were killed on his way back from the meeting with the governor in Kasuwan Magani. An eye witness account said a group of over 50 armed men attacked the monarch’s convoy at about 5pm on Friday 19th October, at Makyali village after Kasuwan Magani, killing his police security officer, Isuwa Simon, and three palace guards. 55 CHRISTIANS KILLED IN MUSLIM ATTACK ON MARKET IN KADUNA STATE, NIGERIA CHURCH BUILDING SET ON FIRE IN ASSAULT THAT ESCALATED, RESIDENTS SAY. JOS, Nigeria (Morning Star News) – Muslims attacked a market in Kaduna state, in north-central Nigeria, on Thursday (Oct. 18), killing dozens of Christians and burning a church building, sources said. The Rev. James Moore of the town’s Evangelical Church Winning All (ECWA), told Morning Star News that the assailants burned down one church building belonging to the Cherubim and Seraphim movement. Moore, who is the area district secretary of the ECWA, said it was difficult to give a definitive casualty figure as the town was in complete lockdown following imposition of a 24-hour curfew the night of the attack. 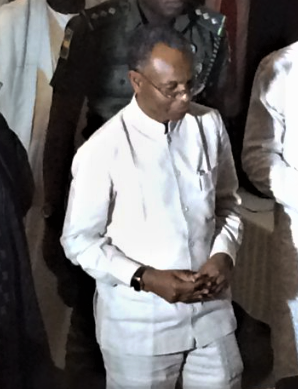 Kaduna Gov. Nasir El-Rufai visited the site in the Kajuru Local Government Area on Friday (Oct. 19) and said 55 people had been killed. “According to what the police have briefed me so far, 55 corpses have been recovered; some burned beyond recognition,” he said. Gov. El-Rufai told reporters that the state government had imposed a curfew in the area and security agencies were restoring calm. He added that the violence was “totally unacceptable,” and that anyone connected with or even observing the violence would be detained. “I have charged the security agencies and the authorities here, local and traditional, to ensure that everyone connected with this, whether as a participant, instigator, or even watching while it is going on, is apprehended and prosecuted,” he said. Area Muslims also attacked Christians on Feb. 26. Luke Waziri, a Christian community leader in Kasuwan Magani, told Morning Star News by phone that during the February attack, 12 Christians were killed. “And 67 other Christians arrested after that incident are currently facing trial in a court in the city of Kaduna,” he added, lamenting that they were detained without cause by police under the direct control of a Muslim inspector general of police and a Muslim police commissioner. “The sad thing is that the police are aware that Muslims in Kasuwan Magani have accumulated weapons with the intent to continually attack us, but they are unable to arrest these Muslims,” Waziri said. Waziri, who is the national secretary of the Adara Development Association (ADA), a predominantly Christian ethnic group in Kaduna state, expressed sadness that while Christians had yet to overcome the trauma of the February attack, Muslims launched an assault on them again on Thursday (Oct. 18).